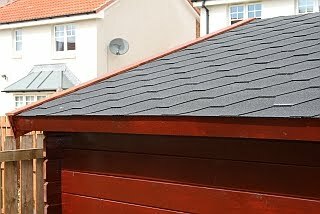 A good quality roof can transform the appearance of garden rooms and bitumen roof tiles offer a cost effective and long lasting solution. The tiles are provided in strips with a self adhesive strip on the back and are designed to expand and contract on the roof without tearing which can be an issue with standard bitumen roofs. Guaranteed for years these tiles are used as for residential homes in Canada, USA and in Europe. Bitumen roof tiles available for home delivery. £10 per square metre with a £50 delivery charge. A typical 4m x 3m garden room will take 15 sqm of bitumen roof tiles to cover and would cost £200 including delivery. Contact us for a quotation. Delivery normally possible within 7 days. Trying out the new share feature on the website. So much to share! I like to think everyone needs a bit of cabin living lifestyle in their lives.